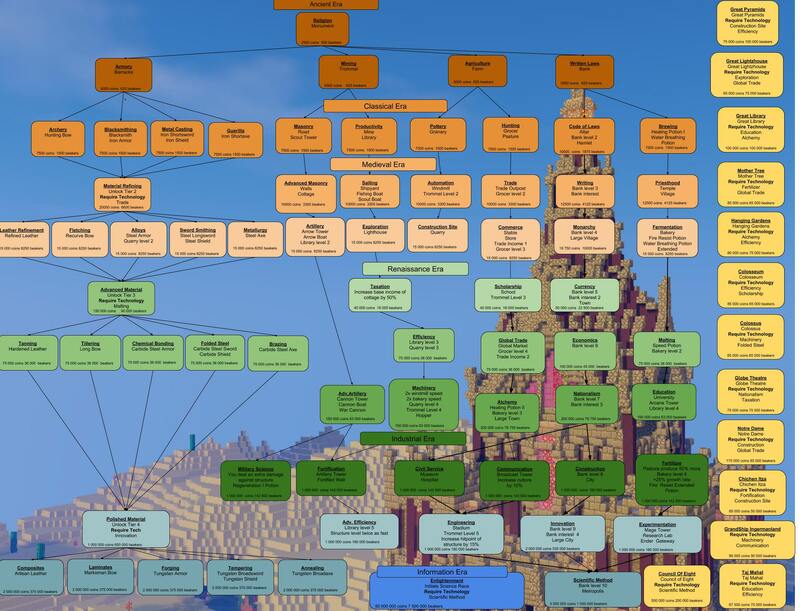 Here is a basic list of all of the major changes from vanilla Minecraft. Some are small, others are quite large. Vanilla Growth is disabled for the following items, they can only be grown on Farms or a Garden. Wheat, Carrots, Potatoes, Beetroot, Netherwart. The Nether is completely disabled. When water touches lava, Netherrack is generated instead of Cobblestone to prevent cobblestone generators. Mob spawners exist, but will not spawn mobs. Horses do not spawn in the wild, instead they must be purchased at the Stables structure. Villager trading is disabled. Emeralds can be exchanged for coins at the Bank structure instead. Some vanilla Minecraft Items are restricted, and can only be crafted if you are a member of a Civ with the proper technology. Leather armor makes you 10% faster, while diamond and iron armor makes you 10% slower. Cobblestone is valuable in that it can be processed in a Trommel or a Sifter. Giving chances for rare minerals. (Iron Ingots, Gold Ingots, Diamonds, and Emeralds). This page was last edited on 27 February 2018, at 04:04.